Amsterdam, April 15, 2019 – Adults suffering from liver disease of unknown cause represent an understudied and underserved patient population. A new study reported in the Journal of Hepatology, published by Elsevier, supports the incorporation of whole-exome sequencing (WES) in the diagnosis and management of adults suffering from unexplained liver disease and underscores its value in developing an understanding of which liver phenotypes of unknown cause in adults are genetic. The effect of WES on adults with liver disease of unknown cause that illustrates the potential clinical value of genome rounds in the individual assessment and medical care of patients. 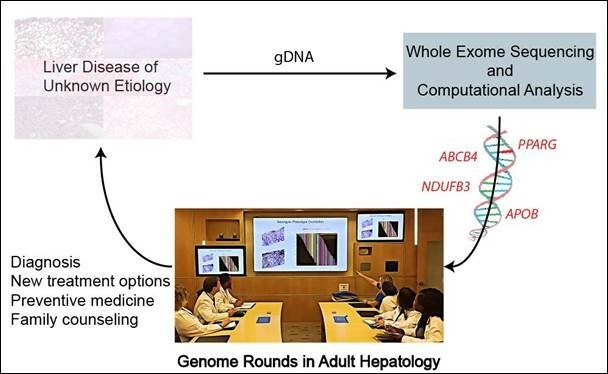 The articles are “Clinical utility of genomic analysis in adults with idiopathic liver disease,” by Aaron Hakim; Xuchen Zhang; Angela DeLisle; Elif A Oral; Daniel Dykas; Kaela Drzewiecki; David Assis; Marina Silveira; Jennifer Batisti; Dhanpat Jain; Allen Bale; Pramod K. Mistry; and Silvia Vilarinho (http://dx.doi.org/10.1016/j.jhep.2019.01.036) and “Individualized medicine comes to the liver clinic,” by Filippo Pinto e Vairo and Konstantinos N. Lazaridis (https://doi.org/10.1016/j.jhep.2019.03.025). They will appear in the Journal of Hepatology, volume 70, issue 6 (June 2019) published by Elsevier. Full text of these articles is available to credentialed journalists upon request; contact Carolien van der Zanden at +31 20 485 3346 or hmsmedia@elsevier.com. Journalists wishing to interview the study authors should contact Dr. Silvia Vilarinho, at silvia.vilarinho@yale.edu. Dr. Lazaridis may be reached for comment at lazaridis.konstantinos@mayo.edu.